"Kṛṣṇa is the Supreme Personality of Godhead. Kṛṣṇas tu bhagavān svayam (SB 1.3.28). There are many expansion of God. Advaitam acyutam anādim ananta-rūpam (BS 5.33). He has got many forms, but this form which we know as Kṛṣṇa, that is the original Kṛṣṇa, or original God. That is stated in the Bhagavad-gītā. Kṛṣṇa says, mattaḥ parataraṁ nānyat (BG 7.7): 'Although I have got many forms, but the original, supreme form is Kṛṣṇa.' But that does not mean that the other forms of Kṛṣṇa, not our manufactured, but as it is stated in the śāstra... Kṛṣṇa has got many names: Rāma, Govinda, Nṛsiṁha, Varāha. There are other forms. Rāmādi-mūrtiṣu kalā-niyamena tiṣṭhan (BS 5.39). Rāma, Nṛsiṁha, Varāha. He has got many forms. Rāma is also expansion of Kṛṣṇa. So these forms... We should not consider they are less powerful than Kṛṣṇa. Not that. But Kṛṣṇa is the original form. The example is given in the śāstra: just like candles. Dīpārcir eva hi daśāntaram abhyupetya (BS 5.46). The... There are thousands of candles, so we get one of them ignited, light up, and then second, then third, then fourth, then fifth—you can go on increasing millions. The each light, each candle, is equally powerful. There is no doubt. 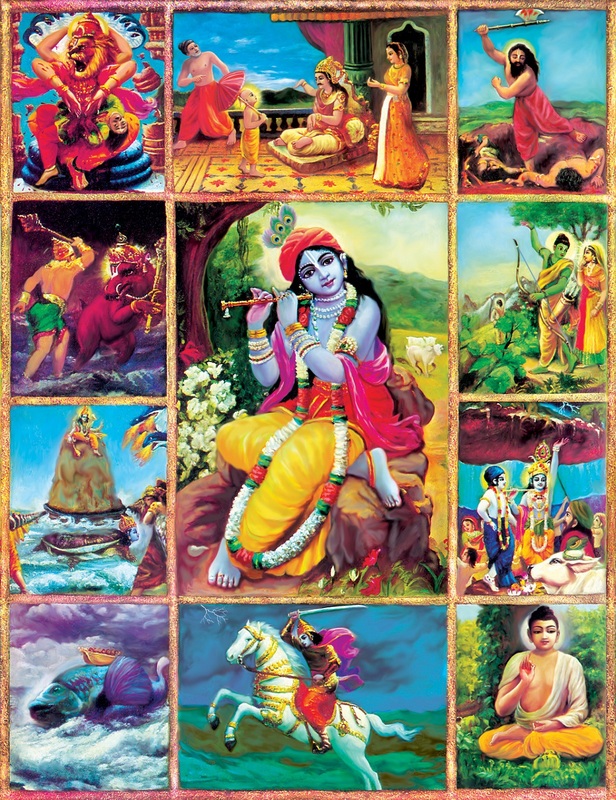 Kṛṣṇa's expansion not... The viṣṇu-tattva. It is called viṣṇu-tattva. Dīpārcir eva hi daśāntaram abhyupetya dīpāyate na hi tathā pṛthag asti hetu (BS 5.46). So viṣṇu-tattva. Viṣṇu-tattva is one, but still, just like the example, candle. One candle, first candle, is Kṛṣṇa. Sarva-kāraṇa-kāraṇam (BS 5.1), govindam ādi-puruṣaṁ tam ahaṁ bhajāmi. This is the conclusion. There are sometimes controversy that 'You do not worship Lord Rāmacandra' or 'You do not chant the name of Rāmacandra first.' These are all material consideration. Either you chant Hare Rāma or Hare Kṛṣṇa, it does not make any difference. If you like, you can begin with Hare Rāma, and if you like, you can... These are, I mean to say, neophyte question, that 'You are not chanting Hare Rāma. You are making discrimination.' We do not make any discrimination. We equally. But I like the form of Kṛṣṇa. Hanumāncandra liked the form of Rāma. But that does not mean that you like any form and he'll be God. No. You have to go according to the direction of the śāstra. Rāmādi-mūrtiṣu. Viṣṇu form, they are stated in the Śrīmad-Bhāgavatam. You have to accept the direction of the authorities." 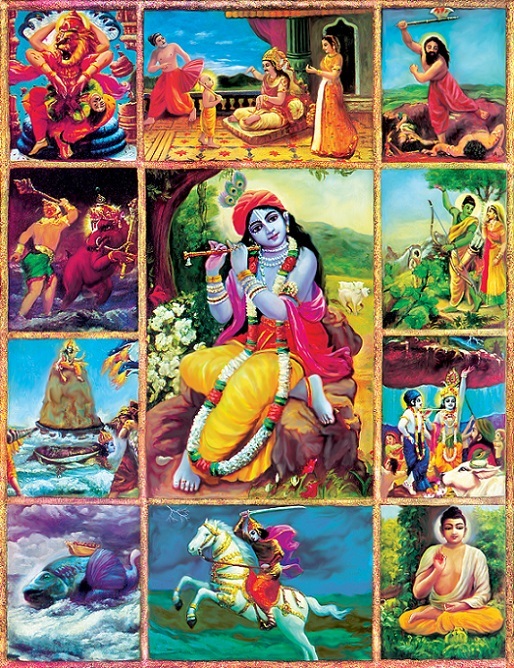 Pictured above (Bhagavad-gita 4.7) In the center square, Krishna is shown in His original two-handed form, holding a flute. Surrounding Him are ten of His eternal incarnations, pictured in the order in which they appear in the material world, beginning clockwise from the lower left-hand corner. 1. Matsya, the fish incarnation, is saving the Vedas. 2. Kurma, the tortoise incarnation, is holding the hill on His back. 3. Varaha, the boar incarnation, is fighting with the demon Hiranyaksa. 4. Nrsimhadeva, the lion incarnation, is killing the demon Hiranyakasipu. 5. Vamanadeva, the dwarf incarnation, is begging some land from King Bali. 6. Parasurama is killing the demoniac ksatriyas. 7. Lord Ramacandra is going off into exile with His wife, Sita, and brother, Laksmana. 8. Krishna is lifting Govardhana Hill, and beside Him is His brother Balarama. 10. Lord Kalki is riding on His horse, killing all the demons and thus liberating them.